There are only a few events in the game that unlock other features of the game. These are unlocked by raising the friendship with those involved with the event. Talk to Gilbert in front of his tent from 6:00 am to 10:00 am when he has 1.5 Music Notes or more. He is glad to see someone who also likes to fish. He explains that he was raised by his traveling grandfather. Gilbert learned to play music to attract crowds, but when he stopped playing the people would leave. He believes they would then forget him. Choice 1: Why worry about that? True, memories are so fickle and can be forgotten. Choice 2: I'm sure some remember you. Perhaps, but humans can forget even their precious memories. Choice 3: I'll remember you! Your kind words lift his spirits. Gilbert then gives you the Skytree Seedling, and says that his grandfather instructed him to find a good place to plant it. This place has good land and people with good hearts. He instructs you to plant and tend to it until it sprouts into the Skytree. You will need a special fertilizer though, which he does not have. After a few days have gone by, go talk to Sam during his shop open time. 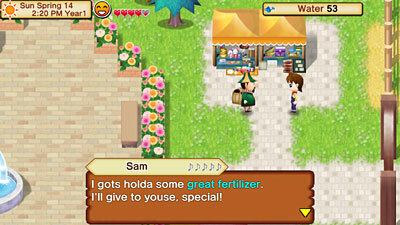 The merchant will give you some Magic Fertilizer. It doesn't seem to do anything on regular seeds, so nobody will buy it. He suggests that you plant it in the mountain. Go up to the top of the mountain and continue east past the Harvest Goddess' shrine. You'll spot a bare area on the ground to plant the Skytree Seedling. After some fertilizer and watering, a great vine magically appears! Rowan explains that climbing the tree will take you to the land above the clouds, where you can meet the Harvest God. At the top of the tree is another shrine with a sleepy old man inside. He says this is the first time that a mortal has climbed all the way up to his place. You can now visit the Harvest God at any time by climbing the Skytree in the mountain. There is an expanded field area on the outskirts of your farm that would allow you to grow more crops and fruit trees. To gain access to these areas you will need to raise your friendship with Brutus the Blacksmith. An easy gift that he likes is Hardwood Lumber and Softwood Lumber, which you can get by chopping trees with your Axe. Then give him a gift each day that you can. Once Brutus is close to 2.5 music notes, in the morning he'll stop by your house in the morning when you wake up. He has built some bridges on your farm for you, so now you can access the other areas of your field space. You'll learn about the mountain as you raise your friendship with Andrea. When you trigger her 1.5 music note event at the Bar after 8:00 pm, she'll tell you that she's felt that the mountain has been angry for some time. 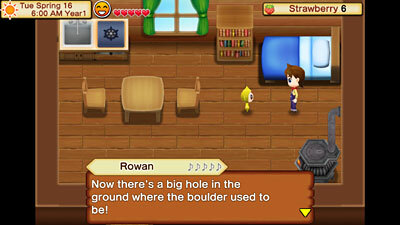 The next morning, Rowan will wake you up to tell you that the boulder by the Harvest Goddess' spring has mysteriously vanished and he wants you to check it out. Head up to the top of the mountain to investigate the missing boulder. Rowan wonders what all the hot air coming out of the hole could mean. Maybe it is the rumored king who rules over the mountain? Supposedly he became so angry that he barricaded himself up in the mountain. You check out the dark hole to find that Rowan's theory is correct; Gorgon the Underworld king is at the bottom of the hole. He is annoyed that you bothered him and demands that you go back up to the surface and leave him alone. You can now visit Gorgon and give him gifts. Once you reach 2-and-a-half music notes of friendship with a villager, they will start to visit your farm area on sunny days. They will just appear there during a set schedule, so if you don't see them right away, enter and exit a building on your farm to make them appear. You can also pinch-and-zoom your screen to expand your viewing area so you can see any visitors without running all over the map. The Harvest Goddess, Harvest God, and Gorgon do not visit your farm. The sprites are already there all day long. Jimmy visits your farm twice per week.